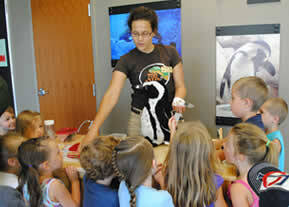 The Minnesota Zoo offers all sorts of fun, educational programs throughout the entire year! From overnight excursions to daily classes and games, you’re never too young (or old) to learn something new at the zoo. The Minnesota Zoo offers entertaining and educational opportunities all year-round for toddlers through adults. We have been connecting people, animals and the natural world for decades and encourage you to get involved and discover wildlife in a wild place! Click the button below to search for programs by age or program type. Field trip planning, STEM programs, zoo classes, teacher resources, homeschool programs and more! Overnights, Scout groups, guided tours, Backstage Pass —all offer something unique. Check out the programs we offer for adults – from behind the scenes tours to travel around the world. SELECT Adults Only Overnight – Animals After Dark Backstage Pass Guided Tours Horticulture Tours: A New View of the Tropics Trail Photography at the Zoo Speaker Series Our World Speaker Series Past Speakers Travel EdVentures Zoo Camp for Adults: Year-Round!